Doleos Holiday Cottages are based just a few miles inland from Aberystwyth, being beautifully converted from an old derelict farm. The owner, Marilyn, is incredibly passionate about bringing the farm back to life by converting the buildings into high standard and simply stunning holiday cottages. The gardens in particular are worth keeping a close eye on year by year. We were approached by Marilyn to design and develop a new website for Doleos that would match and advertise the high standard of accommodation they offer to holiday makers visiting the local area. 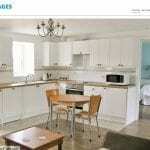 The website needed to be white and blue, with large images showing off the cottages, local area and gardens. It was important for Marilyn to have on each cottage page, a clear space for pictures, facilities, online booking and of course those all important Trip Advisor reviews. We worked closely with Marilyn through the whole website design process, making the new website on our development site so as not to interupt the website that was currently in place. The outcome of the website has received much praise, and we’re really excited to be working closely with Marilyn and the family on the next project.